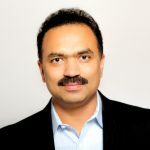 Founder & CEO Kollabio, Inc.
Ashok Nare is the Founder & CEO of Kollabio, Inc., a Connected Digital Solutions company with a focus on making Healthcare holistic and continuous using Wearables and IoT. Mr. Nare has over 20 years of hands-on, leadership and executive experience in enterprise software development, technical leadership and corporate operations. He served as a CTO at multiple startups prior to starting Kollabio, where he was responsible for new product development, building high performance technical teams and establishing technology strategy and vision. His areas of expertise are Digital Strategy, Digital Transformation, Internet of Things (IoT), New Product Development and Agile Software Development. He is an avid promoter of Digital Health technologies and is a frequent speaker at Health & Technology conferences including the mHealth Summit 2015.